JERUSALÉN.- La Universidad Hebrea de Jerusalén ha anunciado en un comunicado remitido a la prensa que ha sido descubierta la tumba y fosa donde fue enterrado el rey Herodes, que gobernó Judea bajo el Imperio Romano y que ordenó, según la Biblia, la 'Matanza de los Inocentes' para asesinar a Jesús a los pocos días de su nacimiento. El hallazgo se produjo en la zona arqueológica conocida como Herodium, próxima a Jerusalén y de él informará en detalle la Universidad en una conferencia de prensa a lo largo de hoy, martes, en Jerusalén. La tumba de Herodes ha sido durante años uno de los restos arqueológicos más codiciados en la zona y el descubrimiento fue hecho por el profesor israelí Ehud Netzer, según informala edición electrónica del diario 'Haaretz', que adelantó la noticia. El Evangelio de San Mateo señala que Herodes ordenó la 'Masacre de los Inocentes'. Por entonces, el monarca había sido declarado 'rey de los judíos' por el Senado romano en el año 40 a.C. Según la Biblia, cuando supo del nacimiento de Jesús, al que popularmente se le conocía como el 'nuevo rey de los judios', por temor a perder su trono Herodes decretó la muerte de todos los niños varones de Belén. De acuerdo a San Mateo, José y María huyeron hacia Egipto con su bebé Jesús para escapar de la matanza, la cual se conmemora en el calendario el 28 de diciembre. Herodes, nacido en el 73 a.C. en la población de Ashkelon, hoy al sur de Tel Aviv, se declaró judío a pesar de que sus padres no lo eran, y fue nombrado gobernador de Galilea a la edad de 25 años. Reinó entre 34 y 40 años, según las distintas fuentes. Las crónicas del historiador judío Flavio Josefo sitúan la muerte de Herodes en torno al año 4 ó 5 a.C. Durante su reinado también se cree que promovió la expansión del Segundo Templo de Jerusalén. Diego Calleja 5/08/2007 8:24 p. m.
Mario Aguila 5/08/2007 10:15 p. m.
Y yo que pensaba que esta página era de historia y no de mitología. Mario Aguila 5/08/2007 10:21 p. m.
byname Herod the Great, Latin Herodes Magnus Roman-appointed king of Judaea (37–4 BC), who built many fortresses, aqueducts, theatres, and other public buildings and generally raised the prosperity of his land but who was the centre of political and family intrigues in his later years. The New Testament portrays him as a tyrant, into whose kingdom Jesus of Nazareth was born. Herod was born in southern Palestine; his father, Antipater, was an Edomite (an Arab from the region between the Dead Sea and the Gulf of Aqaba). Antipater was a man of great influence and wealth, who increased both by marrying the daughter of a noble from Petra (in southwestern Jordan), at that time the capital of the rising Nabataean kingdom. Thus Herod was, although a practicing Jew, of Arab origin on both sides. When Pompey (106–48 BC) invaded Palestine in 63 BC, Antipater supported his campaign and began a long association with Rome, from which both he and Herod were to benefit. Six years later Herod met Mark Antony, whose lifelong friend he was to remain. Julius Caesar also favoured the family; he appointed Antipater procurator of Judaea in 47 BC and conferred on him Roman citizenship, an honour that descended to Herod and his children. Herod made his political debut in the same year, when his father appointed him governor of Galilee. Six years later Mark Antony made him tetrarch of Galilee. In 40 BC the Parthians invaded Palestine, civil war broke out, and Herod was forced to flee to Rome. The senate there nominated him king of Judaea and equipped him with an army to make good his claim. In the year 37 BC, at the age of 36, Herod became unchallenged ruler of Judaea, a position he was to maintain for 32 years. To further solidify his power, he divorced his first wife, Doris, sent her and his son away from court, and married Mariamne, a Hasmonean princess. Although the union was directed at ending his feud with the Hasmoneans, a priestly family of Jewish leaders, he was deeply in love with Mariamne. During the conflict between the two triumvirs Octavian and Antony, the heirs to Caesar's power, Herod supported his friend Antony. He continued to do so even when Antony's mistress, Cleopatra, the queen of Egypt, used her influence with Antony to gain much of Herod's best land. After Antony's final defeat at Actium in 31 BC, he frankly confessed to the victorious Octavian which side he had taken. Octavian, who had met Herod in Rome, knew that he was the one man to rule Palestine as Rome wanted it ruled and confirmed him king. He also restored to Herod the land Cleopatra had taken. Herod became the close friend of Augustus' great minister Marcus Vipsanius Agrippa, after whom one of his grandsons and one of his great-grandsons were named. Both the emperor and the minister paid him state visits, and Herod twice again visited Italy. Augustus gave him the oversight of the Cyprus copper mines, with a half share in the profits. He twice increased Herod's territory, in the years 22 and 20 BC, so that it came to include not only Palestine but parts of what are now the kingdom of Jordan to the east of the river and southern Lebanon and Syria. He had intended to bestow the Nabataean kingdom on Herod as well, but, by the time that throne fell vacant, Herod's mental and physical deterioration made it impossible. Herod endowed his realm with massive fortresses and splendid cities, of which the two greatest were new, and largely pagan, foundations: the port of Caesarea Palaestinae on the coast between Joppa (Jaffa) and Haifa, which was afterward to become the capital of Roman Palestine; and Sebaste on the long-desolate site of ancient Samaria. In Jerusalem he built the fortress of Antonia, portions of which may still be seen beneath the convents on the Via Dolorosa, and a magnificent palace (of which part survives in the citadel). His most grandiose creation was the Temple, which he wholly rebuilt. The great outer court, 35 acres (14 hectares) in extent, is still visible as Al-Ḥaram ash-Sharīf. He also embellished foreign cities—Beirut, Damascus, Antioch, Rhodes—and many towns. Herod patronized the Olympic Games, whose president he became. In his own kingdom he could not give full rein to his love of magnificence, for fear of offending the Pharisees, the leading faction of Judaism, with whom he was always in conflict because they regarded him as a foreigner. Herod undoubtedly saw himself not merely as the patron of grateful pagans but also as the protector of Jewry outside of Palestine, whose Gentile hosts he did all in his power to conciliate. 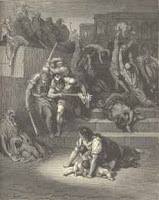 Unfortunately, there was a dark and cruel streak in Herod's character that showed itself increasingly as he grew older. His mental instability, moreover, was fed by the intrigue and deception that went on within his own family. Despite his affection for Mariamne, he was prone to violent attacks of jealousy; his sister Salome (not to be confused with her great-niece, Herodias' daughter Salome) made good use of his natural suspicions and poisoned his mind against his wife in order to wreck the union. In the end Herod murdered Mariamne, her two sons, her brother, her grandfather, and her mother, a woman of the vilest stamp who had often aided his sister Salome's schemes. Besides Doris and Mariamne, Herod had eight other wives and had children by six of them. He had 14 children. In his last years Herod suffered from arteriosclerosis. He had to repress a revolt, became involved in a quarrel with his Nabataean neighbours, and finally lost the favour of Augustus. He was in great pain and in mental and physical disorder. He altered his will three times and finally disinherited and killed his firstborn, Antipater. The slaying, shortly before his death, of the infants of Bethlehem was wholly consistent with the disarray into which he had fallen. After an unsuccessful attempt at suicide, Herod died. His final testament provided that, subject to Augustus' sanction, his realm would be divided among his sons: Archelaus should be king of Judaea and Samaria, with Philip and Antipas sharing the remainder as tetrarchs. Flavius Josephus, the Jewish historian who was of priestly descent, wrote a detailed and vivid account of Herod and his times in his Antiquities, XV, XVI, XVII, 1–8. Josephus, available in many English editions, of which the Loeb, 9 vol. (1926–65), is the latest and best, is the foundation for all later work on Herod. A.H.M. Jones, The Herods of Judaea (1938), is a scholar's appreciation. The article “Herodes” in Pauly-Wissowa Real-Encyclopädie, suppl. vol. 2, pp. 1–199 (1913), is particularly valuable for its complete family tree. Stewart Perowne, The Life and Times of Herod the Great (1956), is the work of one who knew intimately the topography of all of Herod's many architectural creations. Michael Grant, Herod the Great (1971), is a beautifully illustrated book by a scholar of international standing".